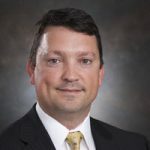 What needs to be done in 2019 to spur more microgrid growth? We asked four microgrid industry leaders – Ameresco, S&C Electric, Schneider Electric and Siemens. Here are their New Year’s resolutions, lightly edited for brevity and clarity. Will Agate, Ameresco’s vice president – microgrid services, expects 2019 to go down as another game changer for the evolving microgrid industry, but says the industry needs to focus on three priorities to reach its full potential. As our industry works on developing scalable solutions, we need to continue engaging with existing public utility companies and independent system operators (ISOs). Within the public utility universe, the spectrum of differing strategies, initiatives, actions, and opinions is very diverse, making it more challenging to determine when microgrid solutions will be accepted. One of the microgrid industry’s highest objectives must include a concerted effort to build the conversation as to how microgrids can help the public utility and ISOs address the changing business environment. This effort will continue with the public utility sector, itself, in determining ways that utilities can identify and add microgrid solutions to their own business offerings. 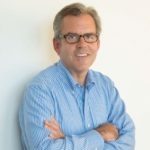 While this issue on its face appears obvious, we believe that this subject is to a certain extent “the elephant in the room.” Starting with the easiest of applications — determining the value of resiliency for a single, industrial user — is rather straightforward, as the math usually and simply comes down to how much revenue is lost, per hour or per day, if power is lost. But, when uncovering the full value of the more complex microgrid opportunities — such as multi-user, school-institution or community microgrids — the question becomes much more complex. External variables such as climate change will likely also influence the importance of resiliency. Ameresco will be prioritizing research and efforts to address this consideration during 2019. To grow the influence of microgrid solutions in the broader marketplace, the wide universe of solutions providers need to continue engaging with one another. One of the reasons that Ameresco is a technology-agnostic developer and owner of energy systems, is our appreciation that we need to continue learning from many qualified technology providers. We appreciate that the engineering services professions and academic research and development communities are constantly developing new design and applications. The existing electric supply industry understands the challenges and desired new business outcomes better than anyone. The work of Microgrid Knowledge — via its conferences and publications — is one of these important ways that all of us can stay committed to this important priority. 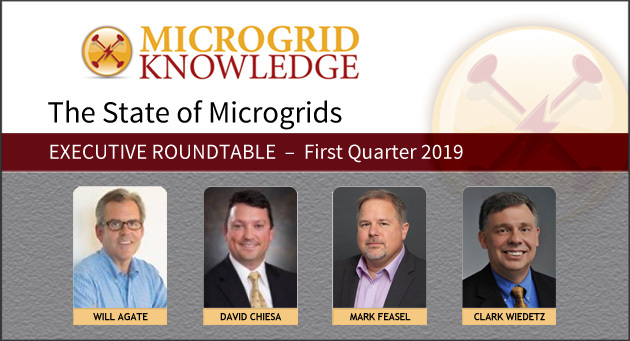 Network with the leaders featured here by joining us at Microgrid 2019: Shaping the New Grid, May 14-16 in San Diego, Calif.
S&C Electric’s David Chiesa cites the need to work on financing and regulatory change. We need to develop a repeatable financing model for deploying microgrids. Why? The obvious answer is to get more microgrids on the grid. But really, microgrid adoption needs better scale. Achieving scale allows the industry to reduce all costs associated with developing a microgrid and the costs of major components associated with a microgrid. 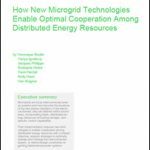 Without scale, it will be difficult to get microgrids to a point where they can be adopted across the board. In 2019, our goal is to achieve economies of scale for microgrids. Otherwise we won’t reach the penetration we need for the industry. Scale makes it possible to control prices and drive adoption. We need to enact regulatory change to ensure fair competition in the microgrid market — both in front of and behind the meter. In other words, we need to make it easier for utilities to be involved with microgrid deployment. The most qualified potential customers for microgrids remain utilities. But existing regulation makes it close to impossible for many of them to actively participate in the space, leaving a huge customer untapped. One of the indicators of a growing microgrid industry, will be further consolidation in the marketplace. We talked about consolidation when Younicos, GreenSmith, OneEnergy, and Viridity were acquired. Another round like that will signal further growth and interest in the microgrid market. I expect to see more of that in 2019. 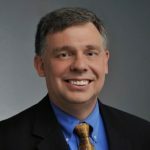 Mark Feasel, Schneider Electric’s vice president, electric utility segment & smart grid, sees microgrid technology increasingly serving humanitarian efforts. Schneider Electric’s Mark Feasel said in an interview with Microgrid Knowledge that improving energy access will continue to be a core focus for Schneider Electric in 2019. According to the International Energy Agency, about one billion people worldwide have no access to electricity, a large swath of them in Sub-Saharan Africa. The United Nations finds that another billion have only intermittent access. Schneider recently launched a containerized microgrid that can be trucked and helicoptered to remote regions and then quickly installed. Called Villaya Emergency, the solar microgrid produces a minimum of 10 kW of peak electricity — enough to power a village, a health center, or refugee camp. The containerized microgrid can help people who are displaced and relocated, a number that’s burgeoned in recent years. Natural disasters, alone, caused 23.5 million to leave their homes in 2016, according to the NGO Oxfam. Refugee camps don’t always have access to electricity grids, and many rely on fossil fueled generators. Villaya Emergency offers a cleaner alternative. But containerized microgrids aren’t just for rural or remote places without adequate grid access; they also can be useful within industrialized nations. Feasel envisions organizations like the Federal Emergency Management Agency (FEMA) and the RED Cross employing them during a domestic crisis. For local communities, they might serve more than one purpose. The containerized microgrids perhaps might keep electricity flowing to hospitals or schools during outages. But then on days when the grid functions normally, they might be used for outdoor celebrations or other activities that require remote power. The challenge, he said, comes in balancing affordability with other goals, such as sustainability and resiliency. Schneider also enters 2019 focused on electrification of transportation, a revolution intertwined with microgrid development. The company recently announced EIQ Mobility, part of a new innovation push by the company. EIQ Mobility offers data-driven electric fleet planning tools to reduce risk for those transitioning away from fossil fuel fleets. The company is positioning for the emergence of electric fleet as-a-service, a one price per mile model. Feasel noted that the company’s focus on transportation extends beyond automobiles to airports and ports, two venues increasingly adopting microgrid technology. For example, Schneider is designing and building a microgrid at California’s Port of Long Beach, the second busiest port in the U.S.
Clark Wiedetz, director of microgrids and renewable integration for Siemens Digital Grid, says that for any market or solution to become sustainable and repeatable, there must be standardization to make profitability more predictable. He cites three types of standardization needed within the microgrid industry. Technical standardization: This may be very difficult for microgrids (maybe impossible) based on the different types of equipment and manufacturers. However, the use of common protocols, control schemes and tariff requirements will reduce the cost and time to market for microgrid projects. The consolidation of regulatory policy around cogeneration applications, back-up generators and renewables are also key to helping commercial and industrial customers comfortably move forward with their microgrid projects. Microgrid controller manufacturers need to make their systems more flexible and easily configurable to accommodate the complex regulatory requirements. The microgrid industry should be able to drive consolidation around “acceptable” business models that make a microgrid system simple to purchase and install. This would be similar to strides made by the solar industry in franchising dealer networks with standardized processes and financing. Siemens is attacking all three areas. The business model is one of the easiest for us to address by offering third party ownership via a simple equipment lease or a more complicated energy as-a-service model. Either way, it allows an end use client (regardless of market segment) to defer the capital expenditure and streamline their cash flow. They improve infrastructure and gain more reliability or reduce overall costs. While standardization may be a challenge technically, we feel a standard controller combined with specific inverters or storage and even some generators is possible. This would reduce overall cost for equipment and installation. Will this cover all of the applications? Hardly, but the industry needs some scope and pricing stability in order to keep the interest of clients and outside investors. Regulatory policy is the most difficult issue to address as it requires multiple entities in the private sector to work with federal, state and local stakeholders. Each entity may have a different driver and “customer.” For example, local government wants to make constituents safer at a reasonable cost, while a utility is rightly concerned with keeping the power going and a private entity may be most concerned with return on their investment. Nonetheless, bringing all entities together has proven to be a successful model for Siemens in our microgrid projects. Total standardization is impossible, but striving for increased standardization would be welcomed by all the participants in this emerging microgrid market. Track news about the microgrid industry by subscribing to the free Microgrid Knowledge newsletter. Few months ago, following the visit of a Microgrid in a remote area of East Africa, I was carried by some pessimism about the ability of the model as one of the viable alternative to electrify Africa. Reading this excellent article brings back optimism and restored some hope. Indeed, the consolidated contribution of the representatives of these four microgrid industry leaders addresses the main obstacles to the full participation of the private sector in the intensification and acceleration of microgrid growth. I particularly liked those of Mark Feasel and Clark Wiedetz as they talk about issues much closer to those we encounter in Africa. There is, however, a subject of paramount importance that Will Agate mentions and succinctly elaborates in his contribution. The lethargic attitude of public utilities (particularly in the case of Africa). They keep a frozen attitude in the face of dazzling innovations happening in the sector. This reminds us the 1990s during which many of our national telecom companies nearly missed the trend to the digital revolution. Today, history seems to be repeated itself because almost all public utilities in Africa remain unconscious to what is happening before their eyes!